Tuesday, January 22, 2019 Dive into some intense naval warfare in this exciting and new Facebook game! For all the military fans who enjoy playing war games or the players who love SLG, there is a big surprise coming to you. 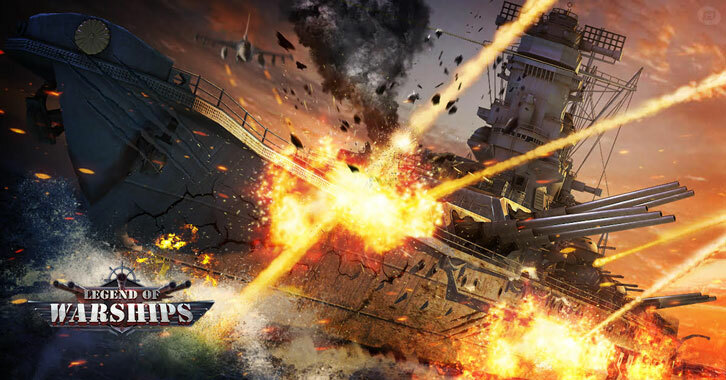 Game Hollywood has just launched its brand new game, Legend of Warships, on December 17th. It’s a classic war game combined with SLG features and card collection gameplay. In Legend of Warships, there is a big variety of replicas of warships from World War II, which reproduces historical scenes of that time and players can immerse themselves in the naval battles. Legend of Warships is a browser game based on the famous mobile game Clash of Battleships, which has enjoyed great popularity in China, Japan, and Europe. Tomonobu Itagaki, the famous Japanese game producer is the senior adviser of this mobile game. It is the endorsement of such a great team that makes this browser game a great achievement. The game takes place in a fiction setting, in which a great naval war breaks out. Three military factions arise in order to regain world peace. Using their large fleets they will begin a war to regain peace. In Legend of Warships, players will be trained to become the best navy commander building their own fleets for victory and freedom. From fast destroyers to destructive battleships, all ships are perfectly replicated from famous warships from World War II. And they are all available to be incorporated into the players’ own fleet! In the naval war of Legend of Warships, players need to build and organize a fleet with all kinds of warships. The warships are based on real models used in World War II. Commanding the warships from 20th century will be an exciting experience for military fans and interesting try for common players. As a warship browser game, there are several ways to command warships in Legend of Warships. Players can get warships by drawing or in other events. Warships of higher quality are stronger and they can be upgraded, customized and trained to increase their BR. Furthermore, players can use spare warships to obtain materials. There is a series of missions in the game in specific oceanic locations. What players need to do is to conquer these locations. This way players will get rewards to equip their fleet better. Remember, players can battle other players from all over the world. Spies are one of the key points in a war. As the commander of a fleet, players need to dispatch their spies to get blueprints of warships, helping build a stronger fleet to win the game. Now it's the time to send your fleet to conquer the enemies' territories! Climb the ranks in the game you will need to battle against players from around the world! Let's defend the honor of our own empire in Legend of Warships!